Welp. 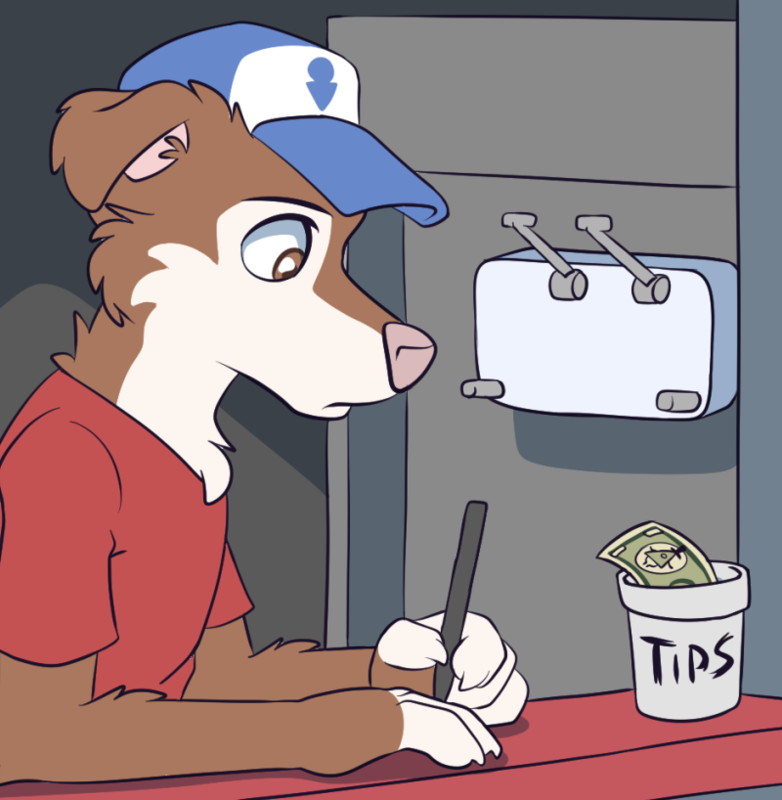 Dipper is working at the ice cream stand. And ice cream is definitely NESSessary. Scooping out ice-cream first NESSessitates having a DIPPER. Oh, I didn’t even notice the Dipper hat. Nice little addition to the comic. Should we really be DRAGON these puns on so long?WHO AM I KITTEN OF COURSE WE HAVE TO!!! I can’t believe I lost like six separate strips to schoolwork. References and easter eggs always make me happy. No, the cat in the Gamercat crossover has green eyes, really dark ear/tail tips and no stripes, and it also looks a bit less purple. You might be thinking of an older vote incentive, where young Kade is asking a light purple girl to “Be my rival <3" on Valentine's Day? When I do extras I usually doodle a random fur pattern and then spin the color wheel until I find something that looks good. I guess I like purple fur. You know what I just realized? Kade is totally wearing the same shorts Ty the Tasmanian Tiger does… The red with yellow flowers. Great Lakes? I know Harvey mentions the sea, but he hasn’t come across as the most geographically knowledgeable person…or caring how long it takes Ness to complete a task. They’re at the Great Lakes. Harvey is just very broken. Whatever happened to the back of Harvey’s skull definitely took it’s toll. Hahah yeah, it’s typical of Harvey XD thanks! Could Harvey died mutilated? Acording to the left bones and the fact It can disappear its arms and legs(?). Clothes are purely decorative in this ‘verse, but swimwear is still traditional for beach episodes. Wet fur doesn’t leave much to the imagination. I’m sure Cthulhu won’t mind. That is if they get icecream for him as well. No tag for Ness’ New Disciple? Not even just “Ness’ Disciple”? You guys are talking about the dog with the Dipper hat but did anyone notice the Mabel shooting-star popsicle? Oh, I didn’t notice that either. It’s amazing the stuff that’s hidden here or there in this comic. Is tail wagging something only young dogs do or is it an involuntary response? Don’t think I’ve ever seen an adult dog wag their tail. In RL all age dogs wag their tail. In the comic I don’t think we’ve seen enough dogs older than Kade and Nicole in the right situations for serious tail wagging. Well yes, but children can have involuntary behavior when they’re a young and overstimulated. I’d imagine the same could apply to anthropomorphic dogs. Ness is the one you think is going to be in trouble? I feel sorry for the poor little kitten who has no idea ness is a killer demonic entity inhabiting an animated stuffed sea dragon. Well unless if the kitten doesn’t provoke Ness but it seems Ness is already distracted from being violent for ice cream. A KILLER NEEDS NO PROVOKATION. Besides, once ness eats enough ice cream, the sugar rush alone will turn her into a hyper tornado of destructive power. I am begining to feel as though the term ‘adorkable’ was coined specifically in preparation for this comic. Weird to ask, but… why is Nicole wearing a bra now when as far as I remember, she never has done so before? Which sums up the last two weeks as well. The clinging fur is the modern explanation. Otherwise, it’s a long running joke to put normally unclothed animal characters in swim trunks and sun glasses. Harvey. The master of disguise and a weapon to surpass metal gear. Cthulhu may be happy to wait, but if we’re talking Old Ones form the deep, it’ll be Dagon they need to worry about. 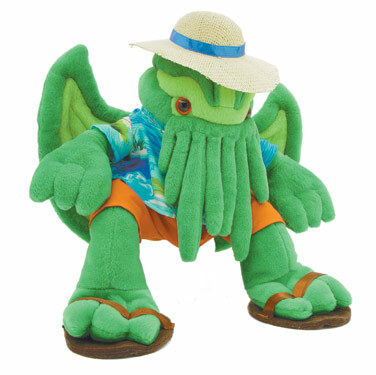 I always figured that Dagon would be grumpier than Cthulhu too, if for no other reason than that you don’t see Summer Fun Dagon plushies that look like Bray Wyatt cosplayers. Harvey is starting to remind me of Shin-Chan. I remember one where his mom walks into a room and gis just lying face down on the floor and says, “I’m a dead body.” And it looks like our cute little Ness has made a new friend. Maybe they should buy Harvey one of those full-body suits for kids with photosensitive skin? It’s both a disguise and an alibi rolled into one! They had scarf’s, maybe they chew through those or something. Seems like elastic worked for a while tho. And that still wouldn’t help with the missing eyes for Harvey. Same thing he did with XY and Omega/Alpha – buy both games and upload all the starters to the Pokemon Bank to transfer them into one game. Oh, Rick must love the beach. In fact, the beach must be crowded with reptiles all summer, since the love the heat and most reptiles enjoy baking on the sand. How does he swim though? I mean, unless its the peak of summer, the ocean can be much colder than is best for reptiles. wont he get too chilled and run a risk of drowning if he forgets to pace himself? That’s why Rick isn’t swimming alone. Rick spends a lot more time at the beach once summer gets into full swing, but Kade and Nicole will only agree to go during these early days when things are a bit cooler.